IF this is Justine Greening, this must be Tuesday. The Shadow Minister for London was in West Hampstead with Conservative parliamentary candidate Chris Philp, all part of the big push against Labour’s Glenda Jackson. A host of people who can expect to be in Cameron’s first cabinet have been doing their bit for the Tories in Hampstead and Kilburn in recent days. Still, in this picture published in today’s Camden New Journal, another arty angle taken by journalist Tom Foot, Gordon Brown seems to want to intrude on the spectacle, like a kid doing bunny ears or making funny faces when everyone’s backs are turned. 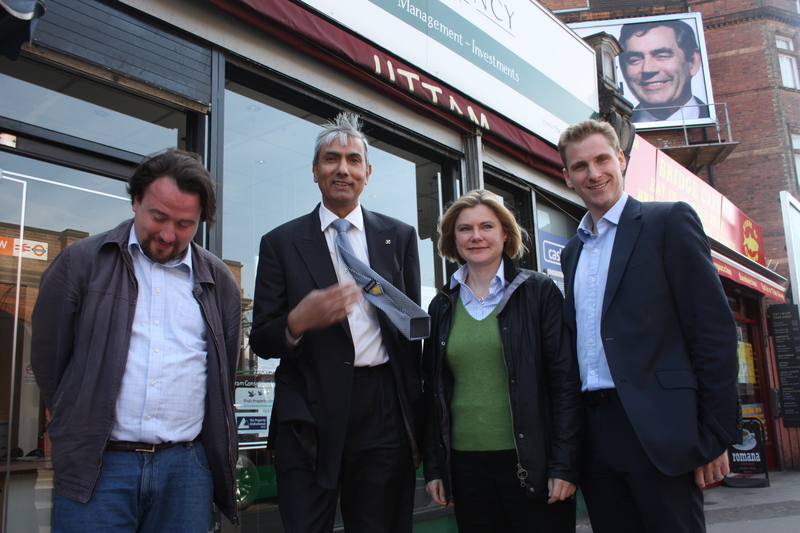 Again, I only noticed when I picked up the finished edition this morning but in this photo his chuckling face – posted on a Conservative party billboard in NW6 – seems to tower over Ms Greening’s visit to meet businesses in West End Lane. the Conservatives want to sell-off as many council homes as they can. a chosen few council homes. The Lib Dems are pushing in leaflet after leaflet through every door ! Labour has sent out a little booklet to every home, with their leaflet. Glenda should come out the winner, with Chris a close second. Gordons smile confirms the deal! Lab/Lib pact.